Legislation sponsored by Rep. Teresa Tanzi and Sen. Harold M. Metts to protect victims of domestic violence by disarming their abusers was signed by Governor Raimondo at a ceremonial bill signing today held in the State Room of the State House. The Protect Rhode Island Families Act (2017-H 5510Baa, 2017-S 0405Aaa), which passed the General Assembly Sept. 19, will prohibit gun possession by domestic abusers convicted of misdemeanor domestic violence crimes and those subject to court-issued final protective orders, and ensure that all those subject to the prohibition actually turn in their guns when they become prohibited from possessing them. 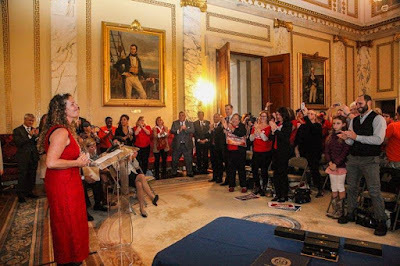 “At last, victims of domestic abuse in Rhode Island will not have the constant fear of knowing that the person who abused them still has a gun. We’ve heard countless stories from victims about flagrant threats and ceaseless fear. And we know that the presence of a gun greatly increases the chances of a domestic violence victim being murdered. We’ve worked very hard to get to this point, and the reward will be greater safety for Rhode Island families,” said Representative Tanzi (D-Dist. 34, South Kingstown, Narragansett). The law developed to its current form through intense negotiations over the course of the three years since it was first introduced, and was the subject of strong public campaigns both for and against it. “This bill will save the lives of people who have already been through too much, and I’m very proud of that. I’m also very proud of the way advocates from opposing interests came to the table and worked together so constructively to help make a bill something that we all can support. This was a great example of how the democratic process and compromise are supposed to work for the benefit of our citizens. While no one got everything they would like, I will say that everyone agreed that victims of domestic violence should not have to live under legitimate fear for their lives, and we’ve cooperated to come up with a bill that greatly improves their protection while addressing Second Amendment concerns,” said Senator Metts (D-Dist. 6, Providence). Under previous state law, abusers convicted of misdemeanor domestic violence crimes and those subject to final restraining orders were not always prohibited from possessing guns nor were they always required to actually surrender the firearms they already possess once they became prohibited. Federal law already prohibits most of those convicted of domestic violence misdemeanors from owning guns, but Rhode Island did not have a mechanism for ensuring that they actually turn them in. The new law closes these loopholes by requiring that abusers are prohibited from possessing guns under state law and are required to turn in their guns swiftly once they become prohibited from possessing them. Under it, those convicted or pleading to a crime of domestic violence have 24 hours to turn in any guns they possess. The act applies to domestic violence crimes including assault, cyberstalking and cyberharrassment, violation of a protective order and disorderly conduct if the criminal act involves the use or attempted use of force or the threatened use of a dangerous weapon. Similar laws prohibiting gun possession by those convicted of misdemeanor domestic abusers exist in 27 states plus Washington, D.C., including Alabama, Texas, Massachusetts, Connecticut and New Hampshire. Those subject to a protective order must surrender any guns they own within 24 hours of receiving notice of the hearing. At the hearing, which must be within 15 days under the amendment, the court may choose to maintain the prohibition, or to immediately return any firearms that were surrendered. The subject of the prohibition must show clear and convincing evidence that his or her firearm ownership is not a threat to the alleged victim’s safety in order for any gun to be returned. Once a prohibited individual has completed his or her sentence, or the protective order has been lifted, he or she would be able to recover the surrendered firearms. Those prohibited from gun possession under the new law may give their guns to someone other than police or a licensed gun dealer, as long as the person is not a relative and does not live in the same household as the prohibited individual. The guns must first be transferred to a licensed firearms dealer, who would ensure that the third party can legally possess firearms. According to research by Everytown for Gun Safety, under the previous law, only five percent of domestic abusers under a final protection from abuse order in Rhode Island were required to turn in their guns. Even in cases when the restrained party’s record indicated a firearms threat, surrender was ordered only 13 percent of the time. When a gun is present in a domestic violence situation, the woman is five times more likely to be killed, According to Everytown. Guns are the preferred weapon of intimate partner homicides. Between 1990 and 2005, more intimate partner homicides in the United State were committed with guns than all other weapons combined. Between 1980 and 2016, 232 Rhode Islanders died as a result of domestic violence, and 48 percent of them were killed with guns.